Are you looking for appliance services in Hyderabad? Whether you need some pampering services for your geyser and refrigerator or air conditioner and TV, HouseJoy can help you. The team of technicians at HouseJoy are well versed in maintaining and repairing a variety of appliances in homes across the big city of Nawabs. You can easily make a booking for any service at HouseJoy.in with just a few clicks. So visit HouseJoy and register so you can make use of the various services they provide to help your appliances look and feel new. Have you ever spent a summer night tossing and turning in your bed because the air conditioner broke down? Are you looking for an AC gas refilling service in the middle of the night? It’s important to service air conditioners regularly to help them keep their cool especially when the stress of summer is at its peak. HouseJoy can help your air conditioner stay snowy and calm with AC repair servicing. Don’t wait for the next big meltdown, book regular servicing online with HouseJoy and the service provider will make sure their team of technicians visit your home and get the job done quickly. And you can get back to enjoying cozy nights with your blanket in the middle of July. Are you searching the Internet for reliable appliance repair services in Hyderabad. Don’t spend another minute Googling for random names and phone numbers. Running after different appliance repair guys can be quite the hassle. Having to call and ask for prices and double check if they can come to your home, takes time and doesn’t always end on a positive note. Avoid the hassle of begging and bargaining for somebody to help. Just visit HouseJoy.in and book repair services for any appliance, big or small. The team of technicians at HouseJoy are highly professional and cater to televisions of all sizes and kinds, refrigerators, air conditioners, ovens and more. The servicing professionals are trained and certified and updated to repair and service all brands and appliance designs. You can find help for each and every home appliances under one roof. One of the most important major appliances in the house is the refrigerator. And if you’re a foodie you know it is The Most Important appliance in your house because it’s got everything delicious inside it. If you’re refrigerator is broken, you can make an online booking at HouseJoy for refrigerator repair service at home. Some technicians can’t make home visits and expect you to transport the bulky refrigerator back and forth from the respective service center. This hassle is more than one person can handle. But the experts at HouseJoy will visit your home to help your refrigerator feel better. HouseJoy caters to all neighbourhoods across Hyderabad. If your fridge requires another part or new wiring. You don’t have to go out hunting for them or a refrigerator service near you. The team at HouseJoy can arrange for the required parts and you can just pay for it along with the service bill. Save the delicious treats in your fridge and prevent future meltdowns by making an online booking for repairs and appliances services in Hyderabad at HouseJoy. Are you missing the World Cup because your television decided to breakdown? Or did your wife cry all night because she couldn’t watch her favorite saas-bahu tv serials? Avoid the drama and score a goal by booking online TV repair services at home. Neither you nor your beloved television will have to step out of the house for repairs. Visit HouseJoy.in from the comfort of your couch and make a booking within a few minutes. 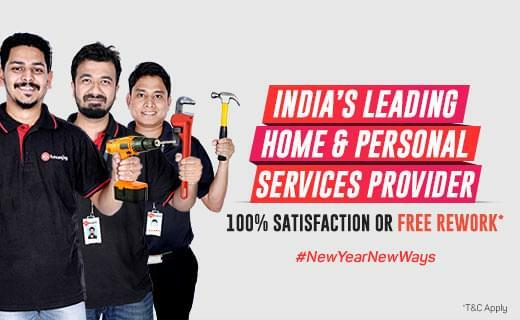 HouseJoy is India’s first personalised service provider and sends technicians to your doorstep to help you get the job done. Save your tears for Messi’s winning goal and those dramatic saas-bahu fights and make an online booking for TV repair services at HouseJoy. Sometimes when the washing machine breaks down, we don’t get it fixed immediately. Of course you can manage for a while but when you’re dirty socks start stinking up your room, you’re going to want to call a repair guy ASAP. Sometimes the real problem is not knowing who to call for help. Someone who can visit your home and do on-site repairs and servicing is hard to find. You don’t need to waste time wondering anymore because HouseJoy is a one-stop shop for all your appliance needs. The service provider caters to repairs and servicing for all appliances, big and small. So log into HouseJoy today and make a booking for washing machine repairs service online. Drinking cold water is a blessing but bathing in it isn’t. Is your geyser broken and sending cold water your way? Avoid the chills and avail geyser repair services at home by making a booking at HouseJoy. Geysers require professional love and care and fixing electronics in the bathroom is a risky affair. This is a complicated DIY that you shouldn’t try to do-it-yourself unless you’ve been trained and certified to do so. Let the experts at HouseJoy visit your home and get the job done for you. HouseJoy caters to homes all over Hyderabad so hurry and make an online booking with them. Microwaves are small but useful in heating everything from dinner and hot cocoa to the popcorn you want to munch on while you watch the new Avengers movie. But it’s only when a microwave oven breaks down that you realise how hard that micro-machine works for you. Cold cocoa and having to use the stove for popping those golden kernels can be awful. Make sure your microwave gets the love and care it needs on a regular basis. Book a session for microwave oven service to help your microwave avoid future burnouts. Thanks to technology, our homes are a haven for various appliances. Making sure they all get the right love and care isn’t an easy task. But you can find a variety of service options for all your appliances at HouseJoy. You can download the app so it’s easier to book numerous services. The app is easy to use and helps you make bookings on the go. Visit the App Store now and download it to make life simpler and better. And if you book multiple servicing sessions and appliance repair services, HouseJoy Assist will assign a dedicated relationship manager to look into your portfolio of tasks. The personal assistance manager will coordinate with various technicians and appliance experts at HouseJoy to ensure your to-do-list is taken care of in a timely and orderly fashion.